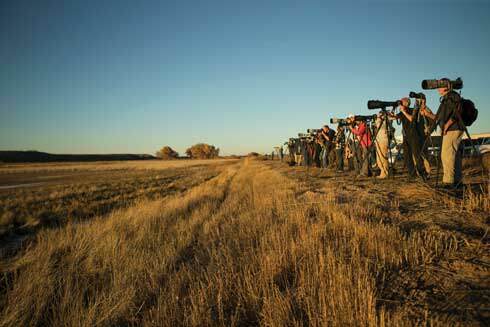 Anticipation is high for the spectacular Bosque del Apache migration season, which takes flight this month. FOR BIRD LOVERS AND NATURE PHOTOGRAPHERS—and anyone else seeking contact with the melodies of prehistory—a cold winter morning at the Bosque del Apache refuge is a kind of symphony inscribed on water and sky. Wake early enough and you’ll have a chance to bear witness to an operatic twining of light and flight, set to a score both ancient and uncanny. As dawn prepares to crawl over the San Pascual Mountains to the east, the place to be is the “flight deck” observation area, a platform floating above one of the ponds on the refuge. There the curious huddle against the bite of the breeze as shutterbugs crouch behind their tripods, framing the desired backdrop, awaiting the moment of liftoff. The first rays of the sunrise bring with them chitterings, honks, and bleats from the marshlands—and finally a great roar and cry, as if a stadiumful of football fans have joined as one to cheer. Snow geese rise like skeins of confetti twisting up into the sky; they peel away into the distance, windblown streamers first white, then black, depending on which way their bodies angle toward the light. Below them, sandhill cranes high-step in the shallow pond water, preparing for their own commute to feeding grounds, and ducks float placidly, as if thoroughly unimpressed by the clamor. All the while the cameras click, their owners hopeful of striking on an iconic image—perhaps, if they’re lucky, the heavy, undulating wingbeats of a line of cranes caught in mid-motion, their slender, curved necks glowing as if gilded. IN HIS CONSERVATION classic A Sand County Almanac, Aldo Leopold wrote: “Some day, perhaps . . . the last crane will trumpet his farewell and spiral skyward from the great marsh.” He offered a similar lament in the form of a question in an earlier essay: “What if there be no more goose music?” These were not the idle speculations of a dour pessimist, but rather very real possibilities, due to overhunting and loss of habitat. In 1939, President Franklin Roosevelt designated a portion of the Middle Río Grande as a national wildlife refuge. Shaped like an isosceles trapezoid just south of the village of San Antonio, the Bosque del Apache, or “Forest of the Apaches,” was one of many conservation efforts that helped prolong the sound of goose music and crane trumpet into our own age; at the time, greater sandhill crane numbers had plummeted to around 1,000. Since then, they have multiplied a hundredfold. Were he still with us today, Leopold would no doubt take satisfaction from their continuing echo down the centuries. He founded the discipline of wildlife management, after all, and few places offer a more vivid picture of its workings than the Bosque del Apache. The refuge comprises three major components: arid grasslands speckled with mesquite; an active floodplain along the Río Grande where willows and cottonwoods thrive; and, most crucially to overwintering birds, a “managed floodplain” where the bulk of refuge manpower is deployed. On this portion of the refuge, water is moved through irrigation infrastructure to simulate the ancient pulse of floods, and a mix of corn and native annual grasses are tended to offer food sources to ducks, geese, and cranes. Native vegetation such as smartweed and millet is encouraged by plowing fields in autumn, flooding them in winter, and slowly drawing down the water in the spring, sometimes by as little as an eighth of an inch per day. The job of growing corn falls to co-op farmers from Isleta Pueblo, who gain access to land and irrigation water on the refuge in exchange for a promise to produce 1.5 million pounds of corn seed for birds. The refuge provides additional land on which those farmers can grow crops for their own profit, primarily alfalfa. —Philip Connors is featured in “Storytellers." This year’s Festival of the Cranes will be held November 15–20, with more than 150 workshops, tours, and presentations in and around the refuge—from specialized photography seminars and horseback rides to tutorials on how to identify raptors and find owls (festivalofthecranes.com). 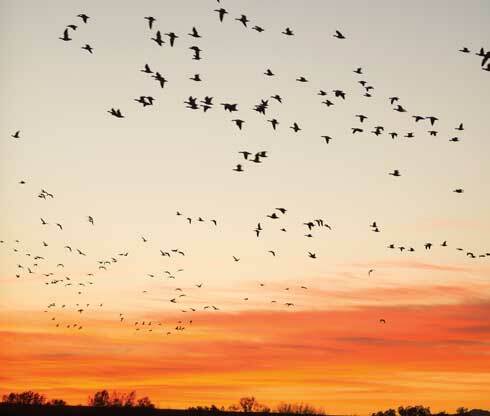 Peak season for migratory waterfowl typically lasts from early November to mid-February; guided tours are offered most weekends as staffing levels permit (575-835-1828). Lodging and other travel amenities can be found in Socorro, 20 minutes from the Bosque (socorronm.org). Special thanks to Holiday Travel Trailers in Albuquerque for the use of the Travel–Lite Toy Hauler. Check out GoRVing.com for more information.